Perhaps one of the best known heroines of history is Joan of Arc. Her bravery, conviction, and ultimate canonization has been an inspiration for men and women alike for centuries. One 1928 silent film captures the drama of her famous story as none other could. The Passion of Joan of Arc follows the famed arrest, trial, and execution of France’s most prominent saint. Director Carl Theodor Dreyer ditched the screenplay written for the film and instead chose to use actual accounts from the trial. 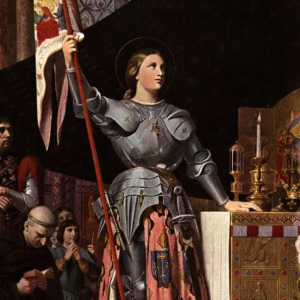 Joan of Arc is well known for being a French nationalist that cross-dressed to lead her fellow Frenchmen to victory over their English enemies in the Hundred Years’ War. She was then captured by English-loyal Frenchmen, tried for heresy, and then burned at the stake for not refuting her claims of divine contact that lead her to war. Such a gripping tale deserves no better a teller than Danish film director Carl Theodor Dreyer. He is known for directing Vampyr, The Passion of Joan of Arc, and Ordet - some of the greatest films of the silent era. Dreyer did immense justice through his use of original trial documents, lighting technique, shooting, cuts, perspective, and lack of makeup. His scenes give no sense of size to the set, distance between people, or time that has passed. Lighting used on the judges and guards is heavy and high in contrast without any makeup on the actors to bring attention to the flaws and crevices of their skin. In comparison, Joan (Renee Maria Falconetti) is shot in soft grays that make her seem serene and in her own world. It is said that Dreyer was brutal during shooting, forcing Falconetti to kneel on hard stone and wipe all emotion from her face to achieve the illusion of deep thought and personal conviction. Legends state that Dreyer forced his leading lady to do this countless times over until his desired results were attained. Despite such originality delivered by Dreyer and Falconetti, the film didn’t sit well with audiences of France or France’s archbishop, for the way it displayed the Catholic Church. Much of it was cut to appease the Church. A complete version was not recovered until 1981, when a copy was found in a Norwegian mental institution. A piece so unique, disorienting, and startling was told so passionately in a way no other can rival. Perhaps this film is left better without words, for Falconetti’s performance is still held as one of the greatest in the history of cinema. The emotions silently conveyed are sure to stay with you for a lifetime. The Passion of Joan of Arc is an undeniable masterpiece.